Windows systems are used to perform numerous tasks seamlessly. Further, you use these systems to store abundant data on it. While these machines are meant to perform seamlessly while offering you a considerable amount of storage space, it may start displaying certain performance issues after a period of time. If you are facing performance issues on your system due to over occupied and cluttered disk space then it’s time to free up or recover disk space on your Windows 10 system. 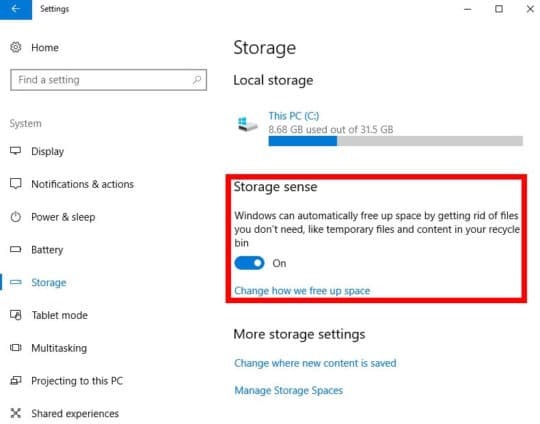 You can use Storage Sense feature on your Windows 10 system to get rid of unnecessary junk files instantly. Here, it offers all basic features to help you to free up disk space by removing temporary files, previous versions of Windows 10, downloads folders, and extra unwanted files. Using this feature, you can recover GBs of disk space. To use this feature, head to Settings > System and then go to Storage. 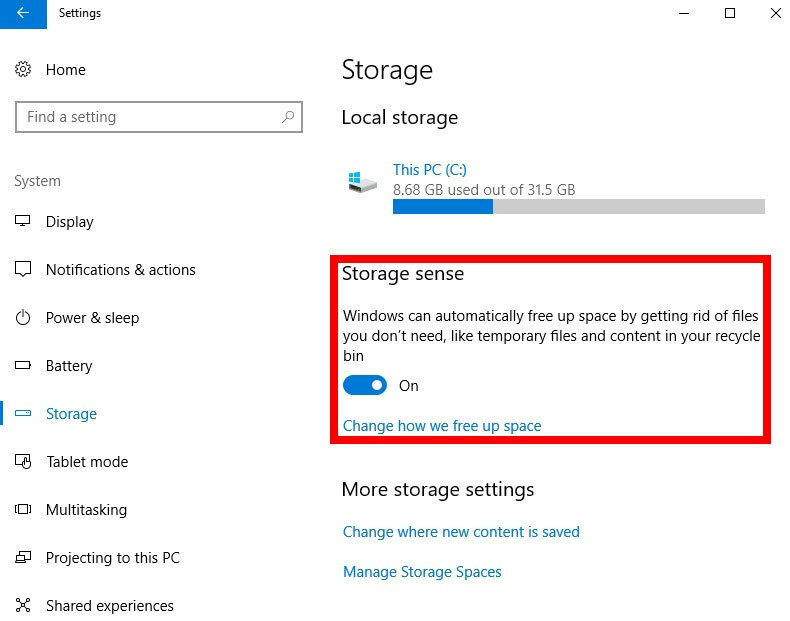 Now tap on “Change how we free up space” option under “Storage Sense”. It will open a new window, where you can select the files that you want to delete. Once you have selected the files to delete, press Clean Now button to remove all selected files. Here, you can toggle off the Storage Sense option until next time you require it. Leaving it on will enable it deleting junk files automatically when there is less space on your system. 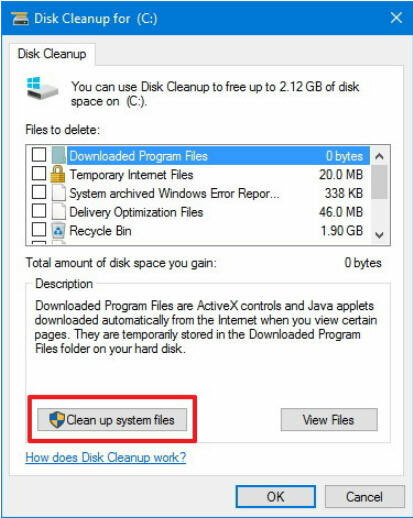 Disk Cleanup option is a useful addition to your system that helps you find and clean various junk files on your system effortlessly. In addition to other junk files, you can use this tool to find and clean obsolete system files and system restore and shadow copies. You can find this useful utility on all Windows versions that help you recover chunks of hard disk space instantly. To access Disk Cleanup utility on your system, go to File Explorer > This PC. Here, select the main system drive (C), right-click on it and select Properties. Now on Properties window, tap on Disk Cleanup button. Now on the Disk Cleanup window, select the items that you want to delete and tap on OK button to instantly remove all selected items. In addition to junk files cleanup, you can tap on “Clean up system files” button at the bottom-left corner to clean system restore and shadow copies. To do this, tap on More Options tab and click on “Clean Up” button under “System restore and shadow copies” option. Duplicate files share the largest part in total junk files on your system. These unnecessary files accumulate on your system due to several reasons like file sharing using different apps, same file downloading for multiple times, data backup etc. Further, these identical files accumulate in different forms like similar photos, identical audio & videos, duplicate documents etc. The manual way to find and clean these identical files consume a lot of efforts and time. Thus, utilizing duplicate file removing tools is the best way possible to delete duplicate photos, audio & videos files, documents, and other identical files. Bloatware is apps & programs on your device that come pre-installed. Here, these programs may come as a free trial or in some other form. The issue with bloatware items is that you don’t use most of these apps & software at all. Thus, these items remain idle on your device occupying precious storage space. 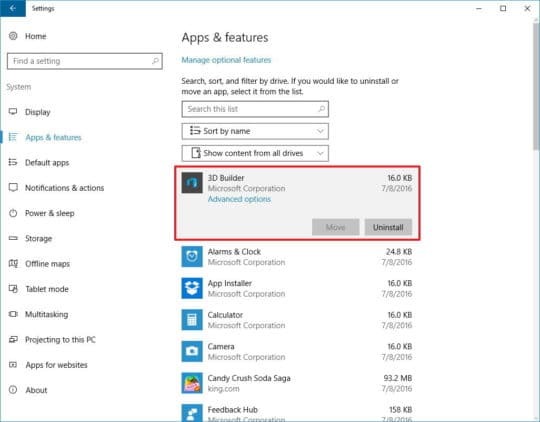 In addition to bloatware, your PC also stores a lot of obsolete apps and other software that you downloaded and used once and stopped using it later. Thus, they occupy valuable disk space for no good reasons. These unnecessary apps and other items not only occupy valuable disk space but it also affects your system performance negatively. 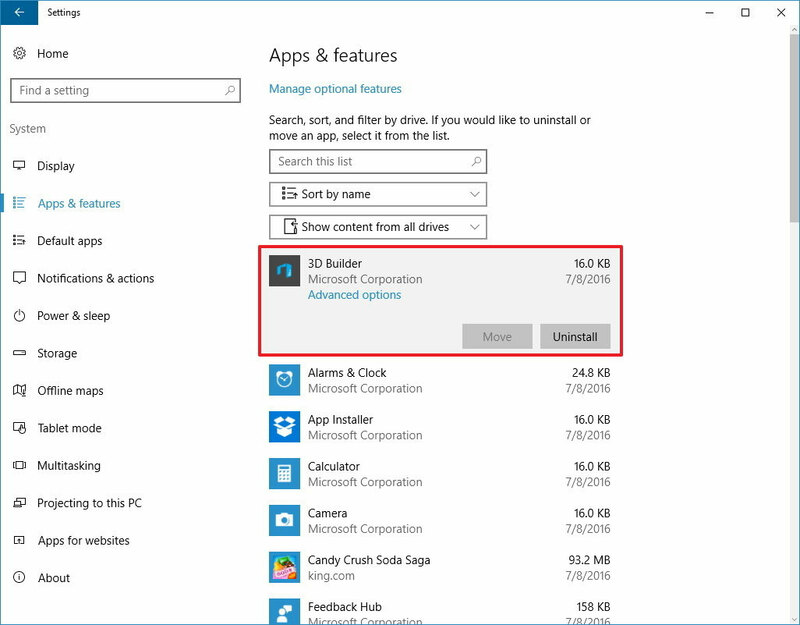 To find and clean these unnecessary items on your Windows 10 system, go to Settings > Apps > Apps & Features. Here, scroll down to find uninstall the unnecessary apps & programs. To uninstall any program, simply select it from the list and tap on Uninstall button given below to it. Further, it allows you to uninstall unnecessary games in addition to these apps & programs. The next best solution to free up some valuable disk space on Windows 10 system is to use cloud or online backup services. Here, you can store all your vital data to cloud servers in a secure way. 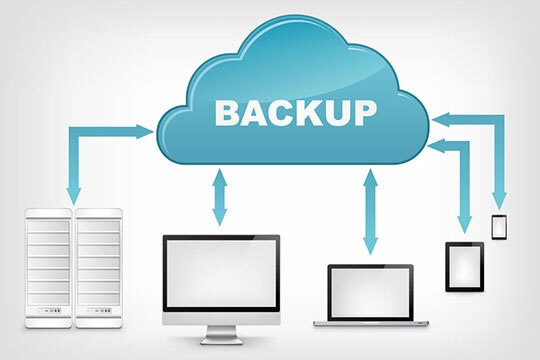 Various online backup services allow you to sync your data within multiple devices to help you store or access it anytime anywhere. Further, these tools offer encryption based services for better security for your data. You can use these smart tools to backup all your necessary data in safe and secure place online.